mindPower™ Assessment — CEO mindPower ltd.
Quick assessment and benchmarking of leadership competencies, i.e. mindPower™ utilisation in individual, team and corporate level for continuous breakthrough. 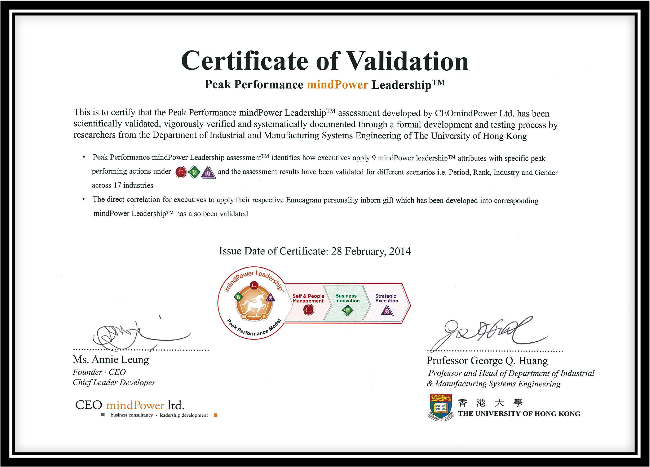 Our exclusive mindPower™ Leadership assessment is scientifically validated by researchers from the Department of Industrial and Manufacturing Systems Engineering of The University of Hong Kong. For the past 12 years, we found that many Hong Kong executives are strong in execution but weak in Innovation, Driving Change, Pursuing Excellence and Inspiring Passion which are the core competencies for them to have significant breakthrough. Contact us at +852 2576 5628 or vicky@ceompower.com now to find out more. Over the last 12 years, we have tracked the results of several thousand executives across 17 industries. Our results reveal that in general HK executives are Pragmatic leaders, strong at Relationship, Analytical & Prudent mP™, and relatively weak in Excellence & Inspiring mP™.